These three container cranes, standing more than 25 stories tall, sailed to the port’s facility with booms raised onboard a large specialized heavy load carrier vessel, the Zhen Hua 27. They are the largest ship-to-shore cranes in Texas, standing about 270 feet tall with a boom length of 211 feet. They will be able to load and unload vessels up to 22 containers wide. One of the cranes is equipped with the technology to remotely operate the crane from a computer in an office setting rather than in the cab of the crane itself. These new cranes are yet another step to ensure Port Houston is ready for the growth and opportunities of the future. Five rubber-tired gantry yard cranes (RTGs) were also delivered on Aug. 8, with five more expected to arrive in September. These cranes will support the current and projected growth in the container business at the facility and improve the vessel productivity and truck turnaround times. The new assets at Bayport will increase cargo-handling efficiency, capacity as well as support the port’s infrastructure. 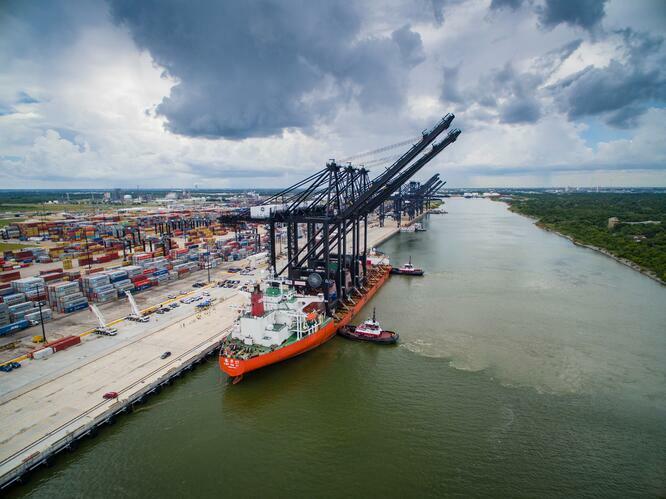 This will bring a total number of 26 ship-to-shore cranes at Port Houston’s container terminals, 13 of which are Neopanamax. Port Houston handles nearly 70 percent of container cargo transported through the Gulf.